Need to squeeze an extra bed into a small living room or home office to accommodate an overnight guest? Here are eight great examples of portable floor beds, each of which can be rolled up or stacked away when not needed. Got a sewing machine? You can make a mattress that you can fold for easy storage in a closet or trunk. 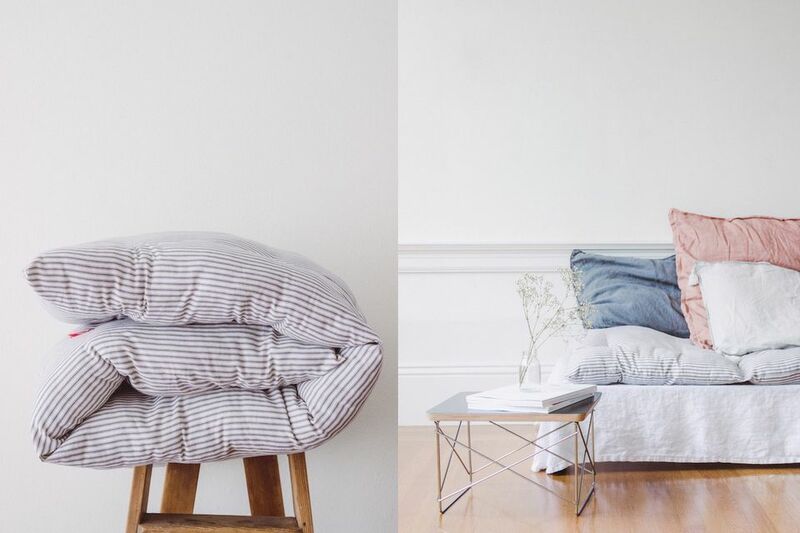 This DIY project from French by Design is so surprisingly popular it almost broke Instagram. It's no wonder Moroccan-inspired floor cushions are a small-space favorite. They are available in a wide range of sizes and shapes, which you can arrange into endless variations to create comfortable low-profile seating. Larger cushions, as shown here, make great day beds. They are available in many styles and sizes from Urban Outfitters, Anthropologie, Etsy, and World Market at prices ranging from $40 to $500. Create a daybed using a twin-size IKEA MINNESUND mattress, which costs $90. For some extra height, we suggest getting two and stacking them and covering with fabric. To prevent slipping, place the mattresses against a wall. During the day, create a backrest with pillows, as shown. When it's time for bed, remove the decorative cushions and add bedding. You can find foam sleeping mats at most big box stores. Portable beds like these fold, so you stash them away until needed. Keep in mind some mats are better for sleeping than others. For your comfort look for options that are at last 3 inches thick, 75 inches long and 30 inches wide, such as this one by Lucid Mattress. Anything less may feel more like yoga mat than a sleeping mattress. If you're looking for a compact solution that rolls up for easy storage, a Thai massage mat checks both boxes. They're available in two mattress sizes—full or twin. Most styles are around 3.5 inches thick. But be warned: You may want to avoid Thai mats filled with Kapok fibers. While the organic material is considered a cushy substitute for goose down, it's highly flammable. If you can sew a straight line, you can DIY this eco-friendly bed called the Original Twist Mattress. Even better, you can customize it to fit your space and needs. Open Your Eyes Bedding sells the instructions and supplies. While you can use any fabric you please, for best comfort stick to 100 percent prewashed, organic cotton. Stuffing the mattress with organic buckwheat hulls will naturally combat dust mites. The hulls are also fire resistant and biodegradable. Air beds come in many forms, and the expensive types don't always last longer than cheaper ones. Adding high-quality sheets and blankets can make an inexpensive air bed just as cozy and comfortable as an expensive one. The super-dense futon mattresses usually sold in the U.S. are usually regarded as permanent features, but authentic Japanese futons are much lighter and can be easily folded and stored in a corner. And real-deal futons are remarkably comfortable and conducive to great sleep.